Gregory Crawford will become Miami's next president July 1. More information is online. (photos by Jeff Sabo). 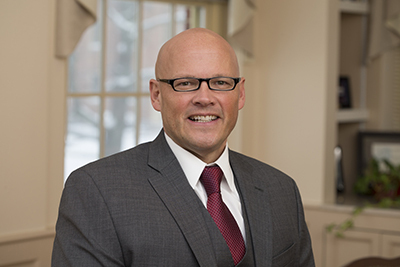 As of July 1, Gregory P. Crawford will become Miami University’s next president. The board of trustees today (Feb. 19) voted unanimously to approve his hiring. Crawford, professor of physics and vice president and associate provost at the University of Notre Dame, will become Miami’s 22nd president following the June 30 retirement of President David Hodge. Crawford also has served as the William K. Warren Foundation Dean of Notre Dame’s College of Science. He has a doctorate in chemical physics from Kent State University. He has published more than 400 research and education publications, review articles and book chapters and holds more than 20 U.S. patents and patent applications. 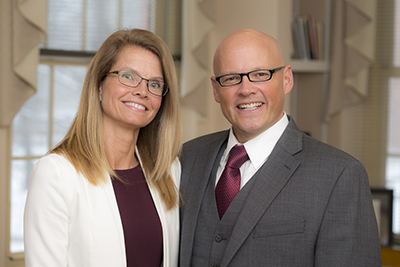 David Budig, chair of Miami’s board of trustees, said the trustees enthusiastically welcome Crawford, his wife, Renate, and their two daughters to the Miami family. “As the university community on all Miami campuses has seen these last few days, he has vast credentials of experience in bringing together multiple disciplines, a passion for the liberal arts, a scholar mindset, and a dedication to community service,” Budig said. Budig again thanked the search committee, composed of faculty, staff, alumni and students from all campuses, for their time and effort in bringing forward such an outstanding candidate. Crawford, an Ohio native, joined Notre Dame’s faculty in 2008. He previously served as the dean of engineering at Brown University, where he had been a professor of physics and engineering. “Having spent my career at two institutions with a strong emphasis on undergraduate teaching and learning, focused on undergraduate research, scholarship and the creative and liberal arts, I believe Miami is a perfect fit for my experience, values and philosophy of higher education,” he said. Crawford and Renate, who also holds a doctorate in physics from Kent State, spent three and a half days on Miami’s campuses this week talking with numerous groups of students, faculty, staff and community members. Crawford said that after spending several days at forums in Oxford, Hamilton and Middletown, he is even more enthusiastic about Miami’s future. 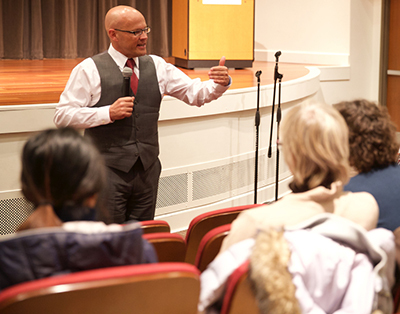 Crawford spoke at forums on the Oxford and regional campuses. The Crawfords are very involved in their communities and in philanthropy and have close ties to Miami — her sister is a “Miami Merger” (the name for couples who meet at Miami and later marry), and he is close friends with legendary football coach Ara Parseghian, (Miami ’48 and a member of Miami’s Cradle of Coaches). In collaboration with Parseghian, Crawford has raised about $2 million in research and clinical trial funds for the Ara Parseghian Medical Research Foundation to find a cure for Niemann-Pick Type C Disease (NP-C). Parseghian’s three youngest grandchildren were diagnosed in 1994 with the disease that causes progressive deterioration of the nervous system. In 2010, the Crawfords embarked on a cross-country bicycle ride to raise awareness and funding. He has since completed five of the “Road to Discovery” rides, totaling nearly 15,000 miles, and last year expanded fundraising to include other illnesses being studied at Notre Dame’s Boler-Parseghian Center for Rare and Neglected Diseases.